American football is getting more like rugby every day. NORMALLY, WHEN AN American football team elects to ‘go for it’ on fourth-down, they’re looking at bulldozing a matter or inches. Anything over two yards, and the special teams crew will already be strapped in to their helmets and ready to roll on. 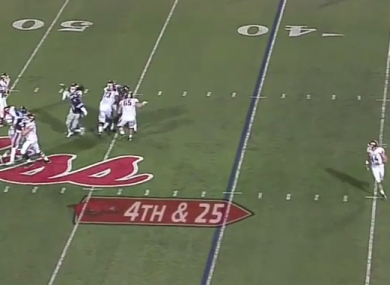 Last night, Arkansas managed to convert a 25 yard fourth down to set them up for the most unlikely of 53 – 52 wins over Ole Miss. They needed two plays and a huge slice of luck to do it. First, quarterback Brandon Allen picks out the only receiver he can see, but Hunter Henry makes the catch over 10 yards from the first down marker with no where to go. Henry takes the hit, spins and heaves the ball back to where it came from. Only in America, eh? And, this being the land of opportunity, Arkansas used the first down to maximum effect, overturning the six-point overtime deficit by scoring a touchdown and the two-point conversion that followed. Email “Fourth-downs just don't come any crazier than this”. Feedback on “Fourth-downs just don't come any crazier than this”.